Honey, a big slobbery Great Dane, is the main character in this mystery-adventure, which begins with a rash of missing puppies and veers into the supernatural via ancient Egyptian mythology. This one is a page-turner. At times, it was too frightening for my seven-year-old and I actually censored references to dogfighting as I read aloud. Different children will have different sensitivities, but violence to animals is very upsetting to Lilah and without skating past references to dogfighting, I would have had to explain that some people think it’s fun to watch dogs kill each other and use puppies as training tools, and we are simply not ready for that. I also made a judgement call and left out the fact that Max the Pit Bull dies. It’s a good, redemptive death–it really is–but it would have been extremely upsetting to Lilah. Maybe in a couple of years. Parents should make the call on whether these are issues their children are ready to deal with, so I wanted to offer the caveats I wish I had had when we began reading the book. The canine characters are fantastic. The humans barely play a part and are mostly oblivious to the goings-on. Besides Honey, there are several other neighborhood dogs, including Bean, the dog sitter’s puppy who stays with Honey and disappears, Max, the scarred Pit Bull newcomer, Newbie, the weird new dog, and Honey’s collection of friends who take an instant dislike to Max, asserting that all Pit Bulls are killers and not to be trusted. As comic relief, the dogs use exclamations like “Oh, ticks!” and “Holy liver treats!” and check peemail at the local lampposts and hydrants. They get away from their humans with astounding ease, but dwelling excessively on how the dogs could plan escapes would have bogged down the action and gotten in the way of the story. Hanna has written the book in such a way that the humans are easily dismissed as not terribly competent and are entirely in the background. The ancient Egyptian lore is integrated very well. 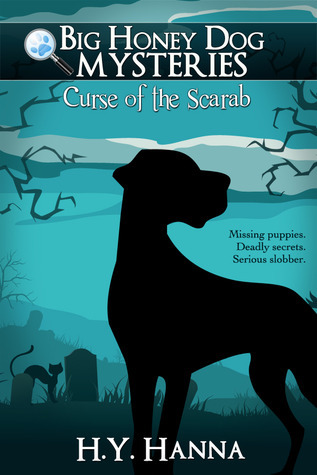 Mysterious scarabs are found at the site of each missing puppy’s last location, leading the dogs to the cemetery and a very strange headstone. One of the dogs uses her Boy’s textbook to translate hieroglyphics. Children familiar with Egyptian mythology may guess the real culprit, but Hanna uses many surprises and twists as the mystery unfolds. Hanna takes on Pit Bull prejudice in a very direct way. None of the other dogs likes Max, simply because of his breed, even Honey. Max (rescued by his Old Man from a dogfighting ring) transcends these stereotypes in the course of the story. Broader application to stereotypes could make for an excellent supplementary discussion. Lilah and I recommend this exciting middle-grade mystery-adventure with some reservations. Source disclosure: I received an e-galley of this title courtesy of the publisher.